Welcome to the best ramen house in New Jersey, Ani Ramen! Growing up in an Asian household and a former New York City ramen “connoisseur”, soup noodles was always one of my go to comfort foods. It never mattered how cold or how hot (although the cold weather does tend to make hot soup taste so much better for obvious reasons), we were always looking for new types of noodle houses to enjoy as a family. That is why Ani Ramen opening right across the street from my office was such a big deal. For starters, the appetizers and specials are incredible. I had the pleasure of trying a few of their “baos” which is basically a “steamed sandwich” stuffed with a variety of options. I personally tried both the pork bao and soft shell crab bao which were absolutely incredible. My group and I also managed to try the miso sake glazed wings which were flavored and fried to perfection. Now the star of the show is of course the ramen. My personal favorite is the classic “Shoyu” flavor with an egg as a topping. The noodles are always “al dente” and the soup is always rich of flavor. To add on how incredible this restaurant is, the staff is absolutely immaculate. They are constantly grateful for the love and support of their customers. I was actually sitting down one day next to a family who did not have any acknowledgement or realization that their food was arriving later than expected. The chef actually came out of the kitchen to apologize and offered to pay the family’s bill. It is genuine acts of kindness that goes a long way. With all that being said, Ani Ramen is a memorable experience. The food is incredible and the staff makes you feel welcomed every time. Looks like I found a weekly luncheon spot across from my office in Summit! 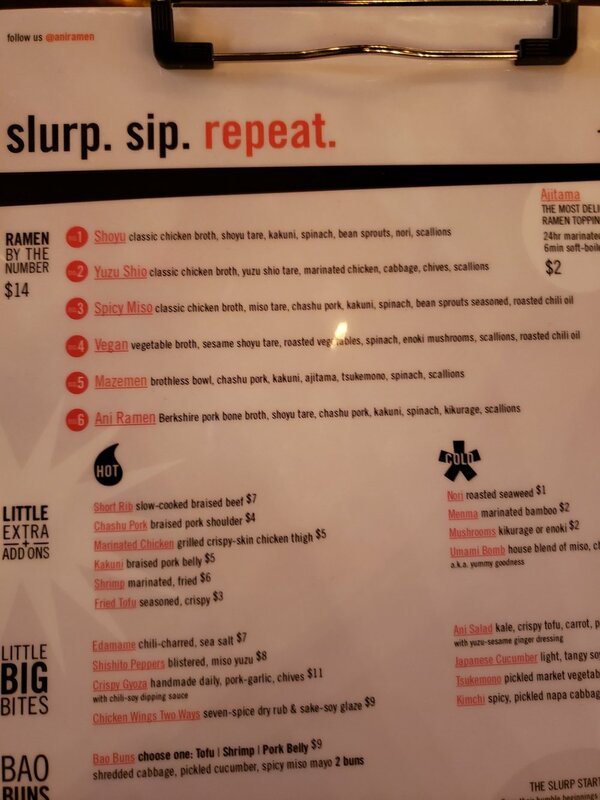 But for those of you who have not been here yet, you definitely got to make a stop at Ani Ramen on 427 Springfield Ave in Summit, NJ 07901 for an incredible experience and amazing ramen.